Value study for "Lake Hickory"
In a previous article entitled "Add Value(s) to Your Paintings" I touched on the importance of value studies as a tool that artists should utilize to better their work. Here I will explain in more detail why value studies are an essential tool for planning a painting. Design. Value studies and design sketches are quite possibly the most important tools available to the artist. In design sketches you work out the composition of the piece utilizing design elements. I use tracing paper for my sketches so that I can overlay one after another after another until I get the composition just right. I may do 3-10 design sketches - don't be afraid to work and rework until it is right. Don't just settle for copying a photograph! Use your skills to design the scene, not copy it. Note the sketch below for a painting entitled "Lake Hickory". Whenever you are doing a sketch, always draw a border around it first. This acts as the frame for the composition - do not let it bleed off the edge of your sketch pad the way so many students do. Here I have a simple landscape with a small boat house as the center of interest. In any landscape scene that contains a building, or something that is manmade, that object will nearly always be the center of interest. 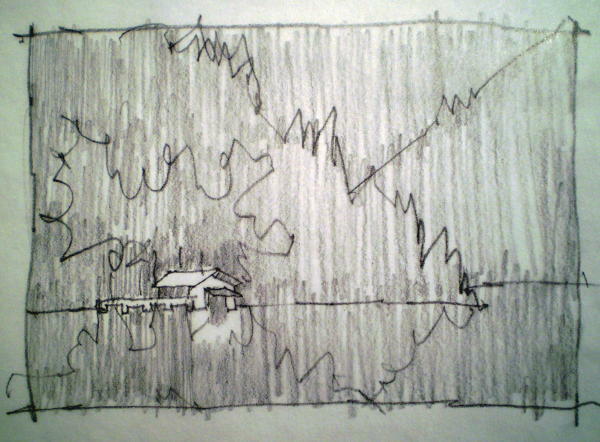 In the sketch below I have overlaid a grid that divides the scene into thirds in each direction. The intersection of these grid lines are the best places to locate your center of interest. Notice that my horizon line is along the grid line too so that it is not located in the center of my composition. Also notice that the slope of the hillside on the right points toward, or leads the eye toward, the center of interest - this is a small example of why you have to design your own scene. Remember these drawings should be small so that you don't take too long developing the study. The pencil study shown is about 3"x5" and the watercolor study is about 7"x10". Laying In Values. I am showing two different approaches to developing a value study: the application of pencil for values and the application of paint for values. I personally like to draw with pencil, so I always use that for my value studies. I find, however that students have difficulty applying pencil tones to paper (they leave most of the paper white), so I ask them to use paint for their studies. You can see the four values that I like to use above. Limiting the number of values helps to greatly simplify the painting process. The first value application is light midvalue and should cover the entire sheet except for the whites you are leaving at the center of interest. Why are we leaving whites at the center of interest you ask? The center of interest must be the most interesting place in the piece, so you need contrast there to make it stand out from the rest of the painting. We need to have our whitest white, our darkest dark, and probably our brightest color in that area. Once this first application is complete you have defined two of the four values: white and light midvalue - you are already halfway done! The second value application is dark midvalue. It should cover areas to begin to separate spatial planes and define shapes. Use the same paint mixture as the first application. Remember these are watercolors so the built up layers will automatically be darker. The last value application is dark value, or the darkest darks. This is where you apply value to make your center of interest really pop. The rich darks make the whites look whiter, giving your work depth. Students and amateur painters are often too timid to lay the darks in, but if you don't your work will look flat, lacking depth. See from the two examples above how the center of interest now pops off the page! There you have it, your value study is complete. The four value system is so easy you only have to apply three layers of paint to create it. This value should only take about 5 minutes to complete after the sketch and design work are done. Remember this is not a finished painting, only a tool. Don't spend time "staying inside the lines". Concentrate on distinguishing the shapes and developing contrast. After you develop the value study the painting of the scene will be 85% complete because you have done your design work and planned your values. Now you can loosen up and apply rich color as I did below for the finished painting. If you need help with your painting values and design skills, Click Here for information on David's "Bigger, Faster, Fresher, Looser" Painting Workshops, or join one of my online courses.